Back in June, author J.K. Rowling announced that she is bringing a new Harry Potter story to the London stage, with Harry Potter and the Cursed Child. The author later unveiled that this will officially be the eighth story in her beloved Harry Potter series, following her seven books that were all adapted into hit movies. The play will debut this summer on London's West End, but for fans who won't be able to see this story unfold themselves, Pottermore has announced that the script will be available for purchase this summer. The Special Rehearsal Edition of the script for Harry Potter and the Cursed Child Parts I and II will be published simultaneously in digital and print editions following the play's world premiere this summer, and will comprise of the version of the play script at the time of the play's preview performances. Theatre previews allow the creative team the chance to rehearse and explore scenes further before a production's official opening night. 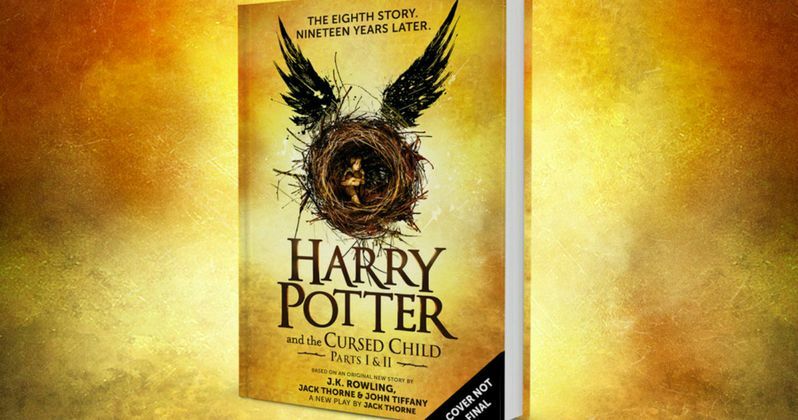 Harry Potter and the Cursed Child opens for previews several weeks before its official first performance on Saturday July 30, and the Special Rehearsal Edition of the script book will later be replaced by a Definitive Collector's Edition. Readers and moviegoers last saw Harry waving off his children at Platform Nine and Three-Quarters, 19 years after the Battle of Hogwarts, in the epilogue to Harry Potter and the Deathly Hallows. Harry Potter and the Cursed Child picks up after that moment and is staged in two parts, due to the 'epic nature of the story'. The play opens in London's West End this summer, based on an original new story by J.K. Rowling, Jack Thorne and John Tiffany. It is officially the eighth story in Harry Potter canon and a new play by Jack Thorne. Jamie Parker (The History Boys) has been cast as Harry, and he is joined by Olivier Award-winning actress Noma Dumezweni as Hermione and theatre, film and TV actor Paul Thornley as Ron. Pottermore also announced that a special edition of Harry Potter and the Chamber of Secrets will be published in October, with new illustrations from Jim Kay. Next year will also mark the 20th Anniversary of the U.K. publication of Harry Potter and the Sorcerer's Stone, with four new special editions being published, one for each of the Hogwarts houses. There will also be a new edition of Fantastic Beasts and Where to Find Them published in 2017, with new content from J.K. Rowling, along with new formats and editions of the Hogwarts Library books Quidditch Through the Ages and The Tales of Beedle the Bard. While we wait for new details about Harry Potter and the Cursed Child, take a look at the Special Rehearsal Edition script cover below. Are you looking forward to reading this new Harry Potter story?